My girlfriend and I are moving into a new apartment next month, and to justify the expense of a new kitchen I promised myself (and my friends) that I would learn new recipes to go beyond my repertoire of a couple of dozen pizza types and pasta sauces. Cooking is a passion of mine, but I feel like I need to extend my knowledge to a wider catalogue of recipes and ingredients. 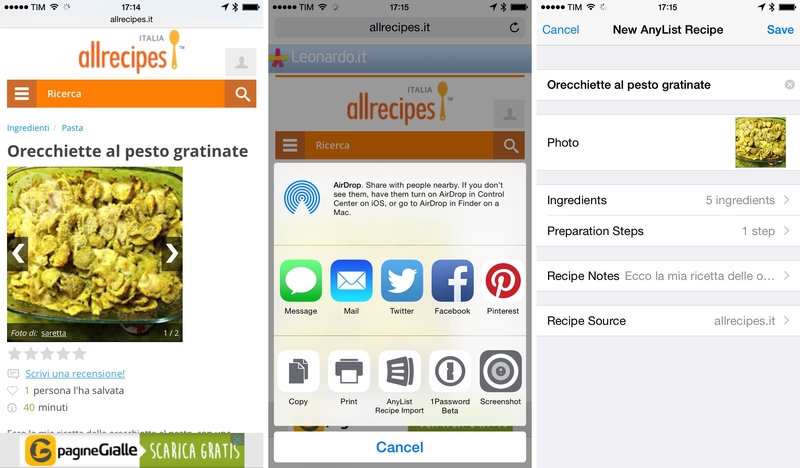 Therefore, I'm in the process of reading and bookmarking several recipe websites (primarily Italian ones) and I thought it'd be interesting to combine that with recipe apps for iOS 8. The first app I stumbled upon is AnyList, which has been updated with an action extension to clip recipes directly from Safari. AnyList is a freemium app: a $7.99 annual subscription unlocks AnyList Complete with support for web clipping, a web app, custom themes, photos, and more. The app looked nice and I really wanted to try the extension, so I purchased a subscription from the App Store. Once installed, the AnyList Recipe Import extension lets you import recipes from Safari by looking at the current webpage in the browser. Ideally, AnyList should be able to parse a recipe's name, photo, ingredients, steps, and notes in addition to the source field, which will be the URL you're viewing. I tested AnyList with popular Italian recipe websites such as GialloZafferano and Allrecipes. I've been fairly impressed with AnyList's ability to extract information from these websites and fill in the proper recipe fields for me, although I've noticed a few issues that required me to manually fix text problems through the editing functionality of the app. For GialloZafferano (the website I visit the most when it comes to Italian recipes), the AnyList extension understands the recipe name, ingredients, and photos, but it can't extract quantities and steps. AnyList allows you to enter an ingredient's name and quantity in two separate fields, and I like that it has a special screen with a numeric pad and buttons for quantities in the American and metric unit system. The extension couldn't parse quantities from GialloZafferano but it worked with Allrecipes. I was surprised to see that the extension brings full editing capabilities to Safari: if a recipe isn't being clipped correctly, you can make all your changes in Safari before saving to AnyList. 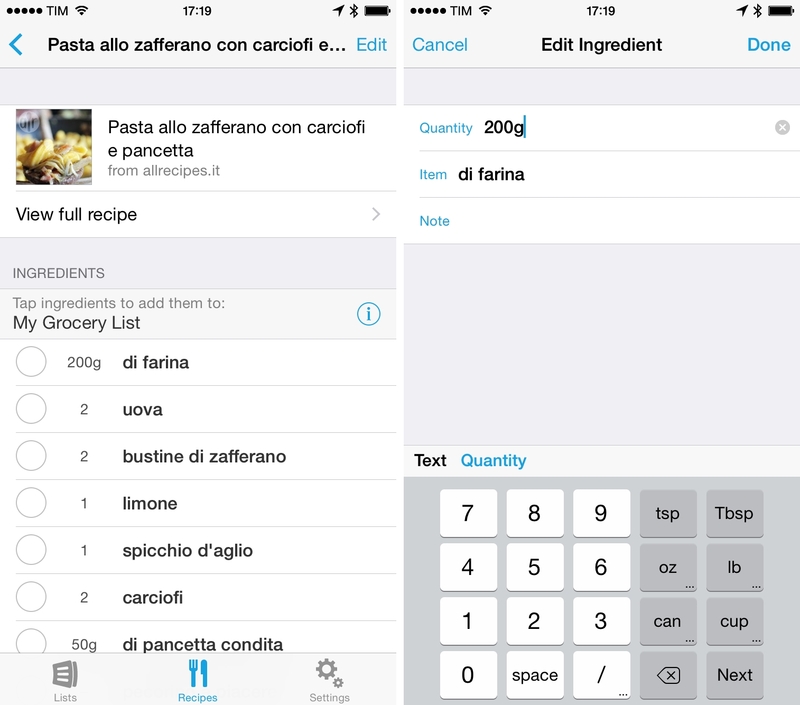 Recognized ingredients can be rearranged, but online search for ingredient names is only available in the AnyList app (obviously, it doesn't support Italian names). Incorrect formatting of recipe steps. The HTML bug is annoying and ugly to look at, but the developers are aware of it. An update to the iOS app will fix it, and the web app doesn't have this problem at all (the things you can fix on the web without an approval process). The web app is functional and handy, but it's essentially a web version of the iPad app. I appreciate its inclusion in the Complete package, though. A recipe clipped from Safari with the AnyList action extension. Once saved from the extension, recipes can be viewed to follow preparation steps or to add ingredients to your grocery list, which can be shared with other people. Premium users can apply custom themes to lists, which also give you access to favorite items and recent ingredients you've used for other recipes. I could see myself using AnyList on a daily basis as we settle into our new apartment, though I would need to test the sharing features in real life scenarios before committing to them (read: poor 3G coverage inside our favorite supermarket). 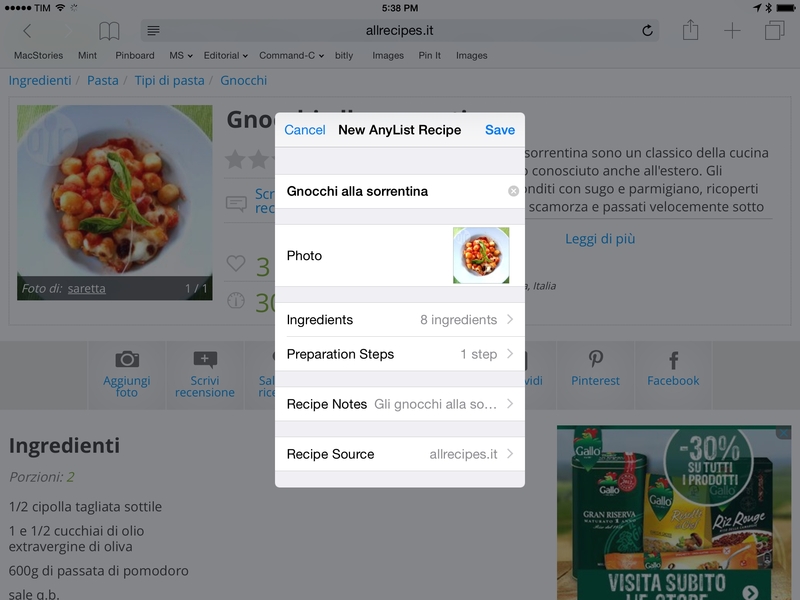 Like Evernote, clipping recipes from Safari just makes more sense with an extension for iOS 8. I couldn't find any other iOS recipe app with this kind of extensibility support, but fortunately I came across AnyList. 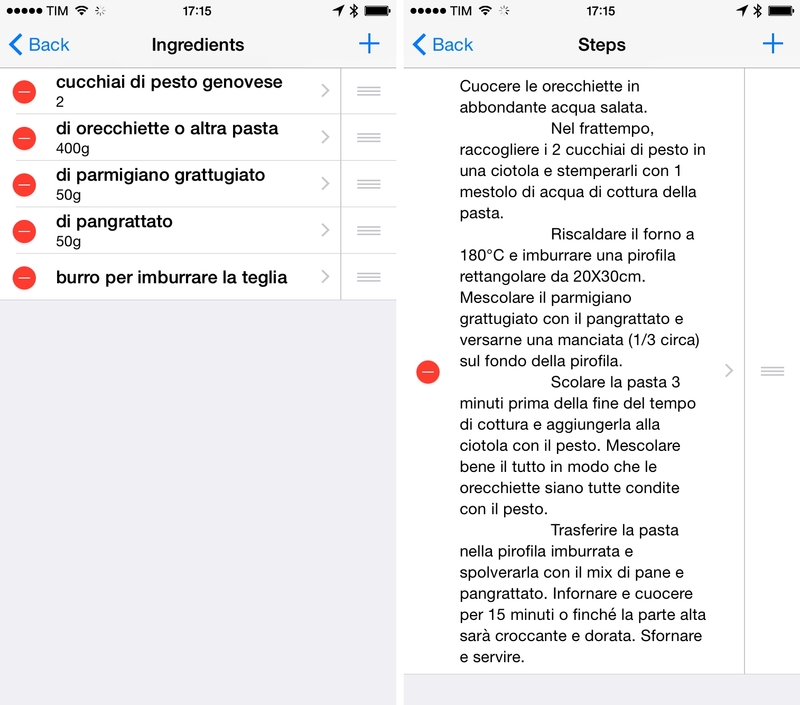 Overall, AnyList works well for Italian websites and requires just a bit of manual editing when recipes aren't fully clipped. Even with these minor limitations, the ability to import recipes from Safari with photos and ingredients in their correct fields is better than what we used to have before iOS 8, and I'm looking forward to more improvements for international users. I'll keep using AnyList and report back from my new kitchen soon. AnyList is available for free on the App Store.